Manchester Show 2011: Pioneer Steez docks for dancers | What Hi-Fi? Now here are some docks with a street-dance difference. Making their debut at the Manchester Show, they are Pioneer's Steez iPod docking systems. Designed with a range of DJ and dance functionality - including tempo-changing without changing pitch, plus dance-off 'Battle' mode - there are two models at launch: the brilliantly named 'Big' and 'Tough'. 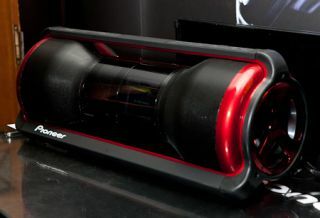 The Big (pictured above) is reminiscent of massive boom-boxes past, including its carry handle, while the Tough (below) claims to be both water-resistant and shockproof. The two designs will be available in the UK in about five weeks' time, priced from around £200-£250 for the Tough, and £300-£350 for the Big. A smaller, even more portable option is planned for future launch.